Louise thought it was freaky, but I told her that stuff like this has been happening to me all the time. It started last night. We went out to dinner with our dear friend Carol, whom I have known since I was a teenager. She knew my mom well and is a big fan of this project. Her partner, Audrey, was also a cherished friend. An extraordinary musician and human being, she was also one of the most funny and famously foul-mouthed women you could ever meet. Sadly, she died last year after a complicated operation. It was just a few weeks after my mom passed away. The three of us talked about our dogs and their various talents. Louise has taught one of ours to pick up all its toys and put them into a basket. She and the dog are both understandably quite proud of this. Talk turned to hundred dollar bills and, inevitably, to Audrey. 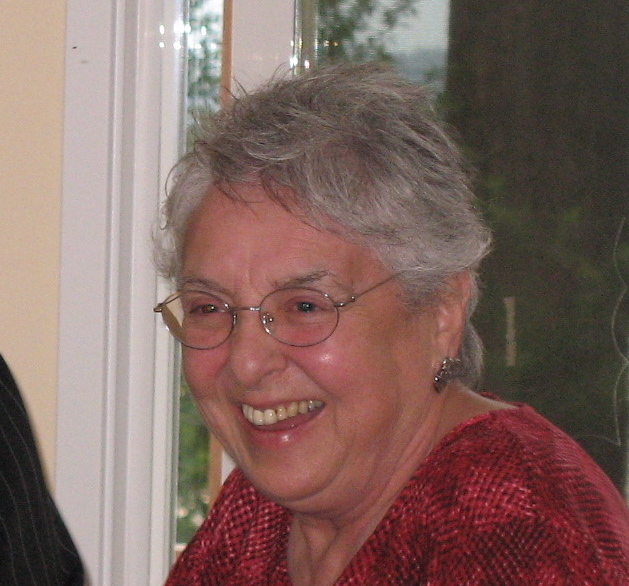 I miss her very much. We all do. Audrey played piano brilliantly, was an enthusiastic and discriminating listener, and encouraged many talented young musicians. I said I wanted to honor her with my next gift. 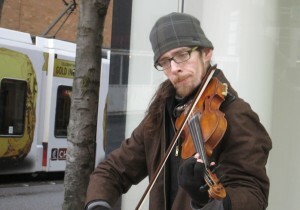 “When I see a fiddle player busking on the corner, that’ll be the one,” I announced. 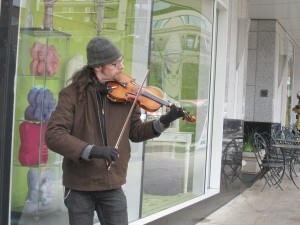 We went to a movie this afternoon and, sure enough, there he was: a guy on the corner sawing away on his violin. The rain had slowed to a drizzle and the open case in front of him was filled with scattered coins and a few dollar bills. While Louise waited in the long line for tickets, I went to listen. The guy was good; he seemed heartened to have an attentive audience and played a lovely piece. When he finished, I told him I liked it and asked how he was doing. “Okay. Just trying to eke out a living,” he said. He’s from Baltimore and has lived in the Northwest for the past nine years. He’s been playing violin for 35. “I teach lessons and play a bunch of gigs around town, but it’s just never enough to live on,” he shrugged. He said his name was Timothy and started scribbling on a scrap of paper. “If you send me an email, I’ll let you know where I’m playing,” he offered. I told him about the blog and asked him to post the info for everyone to see. “I’ll do that,” he said. “Thank you very much!” I told him I hoped it would be the beginning of a shower of good fortune. We shook hands. The movie, “I Am“, was pretty interesting. By the director Tom Shadyac (Ace Ventura, Bruce Almighty), it’s about his realization that being a man who “had everything” didn’t necessarily mean he had anything at all. He sets out to answer these two fundamental questions: What is wrong with the world? What can be done about it? There’s some heady stuff, like quantum entanglement and apparently sentient yogurt. See for yourself and let me know what you think. It’s complicated, but I agree to an extent with his premise of what is wrong with the world (“I Am”). As far as what is right with the world? That’s easy. We Are. Timothy reminds me of my brother. My brother can play the viola. My childhood was a torture of hearing him practice and constant symphony concerts. But now he doesn’t play for various, shall we say, excuses. Sigh. I wish he would have continued. Even if only on a street corner. He is talented enough people would listen. I’m sad he has set aside his talent and gifts. Our family made many sacrifices so he could get a good musical education. I feel he “owes” us to continue playing. Is that selfish of me to think so? Or is he the selfish one? Your 100 dollar gifts are indeed wonderful and generous but there are other ways for people to be generous. Like in sharing their talents as Timothy does. If I was near to where Timothy was playing I’d get to hear him whether I gave him money or not. He is being generous with his gift even while hopeful for a bit of money. I used to work in The United Way Building on 11th and Morrison, so these are my old stomping grounds. I used to walk all around Portland on my lunch breaks. I am almost certain I experienced Timothy’s violin because I would occasionally park in the parking structure there. I loved the jive of Portland and must visit soon to experience its flavors, people and music. Thank you, Jill.